Video simulation showing the warping of space-time and gravitational waves produced, during the final inspiral, merge, and ringdown of black hole binary system GW150914. Slow motion computer simulation of the black hole binary system GW150914 as seen by a nearby observer, during 0.33 s of its final inspiral, merge, and ringdown. The star field behind the black holes is being heavily distorted and appears to rotate and move, due to extreme gravitational lensing, as space-time itself is distorted and dragged around by the rotating black holes. ^ The ringdown phase is the settling down of the merged black hole into a sphere. ^ The name format is the initials of "Gravitational Wave" plus the date format yy-mm-dd of 2015-09-14 making the name GW150914. ^ Despite the tremendous energy emission, the effects of the gravitational waves on a human located only one AU from the merger event would have been minor and survivable. , obtainable from the "Tests of general relativity ..." paper (p. 13, "Thus, we have...") and the Planck–Einstein relation. ^ a b c d e The LIGO Scientific Collaboration and The Virgo Collaboration (2016). "An improved analysis of GW150914 using a fully spin-precessing waveform model". Physical Review X. 6 (4): 041014. arXiv:1606.01210. Bibcode:2016PhRvX...6d1014A. doi:10.1103/PhysRevX.6.041014. ^ a b c d Abbott, Benjamin P.; et al. 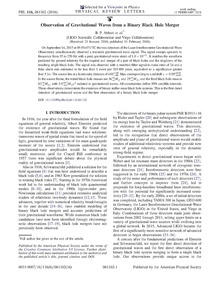 (LIGO Scientific Collaboration and Virgo Collaboration) (2016). "Properties of the binary black hole merger GW150914". Physical Review Letters. 116 (24): 241102. arXiv:1602.03840. Bibcode:2016PhRvL.116x1102A. doi:10.1103/PhysRevLett.116.241102. PMID 27367378. ^ a b c d e f g h i j k l m n o p q r s t Abbott, Benjamin P.; et al. (LIGO Scientific Collaboration and Virgo Collaboration) (2016). "Observation of Gravitational Waves from a Binary Black Hole Merger". Phys. Rev. Lett. 116 (6): 061102. arXiv:1602.03837. Bibcode:2016PhRvL.116f1102A. doi:10.1103/PhysRevLett.116.061102. PMID 26918975. Lay summary (PDF). ^ a b c d e f g h i j k l Castelvecchi, Davide; Witze, Alexandra (11 February 2016). "Einstein's gravitational waves found at last". Nature News. doi:10.1038/nature.2016.19361. Retrieved 11 February 2016. ^ The Editorial Board (16 February 2016). "The Chirp Heard Across the Universe". New York Times. Retrieved 16 February 2016. ^ a b "Einstein's gravitational waves 'seen' from black holes". BBC News. 11 February 2016. ^ Castelvecchi, Davide (23 March 2016). "The black-hole collision that reshaped physics". Nature. 531 (7595): 428–431. Bibcode:2016Natur.531..428C. doi:10.1038/531428a. PMID 27008950. ^ a b c d e Naeye, Robert (11 February 2016). "Gravitational Wave Detection Heralds New Era of Science". Sky and Telescope. Retrieved 11 February 2016. ^ a b Blum, Alexander; Lalli, Roberto; Renn, Jürgen (12 February 2016). "The long road towards evidence". Max Planck Society. Retrieved 15 February 2016. ^ Radford, Tim (11 February 2016). "Gravitational waves: breakthrough discovery after a century of expectation". The Guardian. Retrieved 19 February 2016. ^ a b Harwood, W. (11 February 2016). "Einstein was right: Scientists detect gravitational waves in breakthrough". CBS News. Retrieved 12 February 2016. ^ a b Drake, Nadia (11 February 2016). "Found! Gravitational Waves, or a Wrinkle in Spacetime". National Geographic News. Retrieved 12 February 2016. ^ Stuver, Amber (12 February 2016). "Your Questions About Gravitational Waves, Answered". Gizmodo (Interview). Interviewed by Jennifer Ouellette. Gawker Media. Retrieved 24 February 2016. ^ a b c d e f g h i Abbott, Benjamin P.; et al. (LIGO Scientific Collaboration and Virgo Collaboration) (2016). "Tests of general relativity with GW150914". Physical Review Letters. 116 (221101): 221101. arXiv:1602.03841. Bibcode:2016PhRvL.116v1101A. doi:10.1103/PhysRevLett.116.221101. PMID 27314708. ^ a b c d e f g Abbott, Benjamin P.; et al. (LIGO Scientific Collaboration and Virgo Collaboration) (20 February 2016). "Astrophysical implications of the binary black-hole merger GW150914". The Astrophysical Journal. 818 (2): L22. arXiv:1602.03846. Bibcode:2016ApJ...818L..22A. doi:10.3847/2041-8205/818/2/L22. ^ a b CNN quoting Prof. Martin Hendry (University of Glasgow, LIGO) - "Detecting gravitational waves will help us to probe the most extreme corners of the cosmos -- the event horizon of a black hole, the innermost heart of a supernova, the internal structure of a neutron star: regions that are completely inaccessible to electromagnetic telescopes." ^ a b Ghosh, Pallab (11 February 2016). "Einstein's gravitational waves 'seen' from black holes". BBC News. Retrieved 19 February 2016. With gravitational waves, we do expect eventually to see the Big Bang itself. ^ Overbye, Dennis (15 June 2016). "Scientists Hear a Second Chirp From Colliding Black Holes". New York Times. Retrieved 15 June 2016. ^ a b "GW150914: LIGO Detects Gravitational Waves". Black-holes.org. Retrieved 16 February 2016. ^ Einstein, A (June 1916). "Näherungsweise Integration der Feldgleichungen der Gravitation". Sitzungsberichte der Königlich Preussischen Akademie der Wissenschaften Berlin. part 1: 688–696. Bibcode:1916SPAW.......688E. ^ Einstein, A (1918). "Über Gravitationswellen". Sitzungsberichte der Königlich Preussischen Akademie der Wissenschaften Berlin. part 1: 154–167. Bibcode:1918SPAW.......154E. ^ Schutz, Bernard (31 May 2009). "9. Gravitational radiation". A First Course in General Relativity (2 ed.). Cambridge University Press. pp. 234, 241. ISBN 978-0-521-88705-2. ^ a b Commissariat, Tushna; Harris, Margaret (11 February 2016). 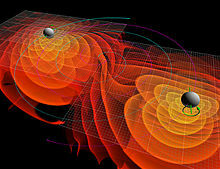 "LIGO detects first ever gravitational waves – from two merging black holes". Physics World. Retrieved 19 February 2016. ^ LIGO Scientific Collaboration and VIRGO Collaboration (16 July 2010). "Predictions for the rates of compact binary coalescences observable by ground-based gravitational-wave detectors". Class. Quantum Grav. 27 (17): 173001. arXiv:1003.2480. Bibcode:2010CQGra..27q3001A. doi:10.1088/0264-9381/27/17/173001. ^ Staats, Kai; Cavaglia, Marco; Kandhasamy, Shivaraj (8 August 2015). "Detecting Ripples in Space-Time, with a Little Help from Einstein". Space.com. Retrieved 16 February 2016. ^ Weisberg, J. M.; Taylor, J. H.; Fowler, L. A. (October 1981). "Gravitational waves from an orbiting pulsar". Scientific American. 245 (4): 74–82. Bibcode:1981SciAm.245d..74W. doi:10.1038/scientificamerican1081-74. ^ Weisberg, J. M.; Nice, D. J.; Taylor, J. H. (2010). "Timing Measurements of the Relativistic Binary Pulsar PSR B1913+16". Astrophysical Journal. 722 (2): 1030–1034. arXiv:1011.0718v1. Bibcode:2010ApJ...722.1030W. doi:10.1088/0004-637X/722/2/1030. ^ "Press Release: The Nobel Prize in Physics 1993". Nobel Prize. 13 October 1993. Retrieved 6 May 2014. ^ Kramer, M.; et al. (14 September 2006). "Tests of general relativity from timing the double pulsar". Science (published 6 October 2006). 314 (5796): 97–102. arXiv:astro-ph/0609417. Bibcode:2006Sci...314...97K. doi:10.1126/science.1132305. PMID 16973838. ^ "LIGO Hanford's H1 Achieves Two-Hour Full Lock". February 2015. Archived from the original on 22 September 2015. Retrieved 11 February 2016. ^ Abbott, Benjamin P.; et al. (LIGO Scientific Collaboration and Virgo Collaboration) (2016). "Prospects for Observing and Localizing Gravitational-Wave Transients with Advanced LIGO and Advanced Virgo". Living Reviews in Relativity. 19 (1): 1. arXiv:1304.0670. Bibcode:2016LRR....19....1A. doi:10.1007/lrr-2016-1. PMC 5256041. PMID 28179853. ^ a b Cho, Adrian (11 February 2016). "Here's the first person to spot those gravitational waves". Science. doi:10.1126/science.aaf4039. ^ Castelvecchi, Davide (12 January 2016). "Gravitational-wave rumours in overdrive". Nature News. doi:10.1038/nature.2016.19161. Retrieved 11 February 2016. ^ Castelvecchi, Davide (16 February 2016). "Gravitational waves: How LIGO forged the path to victory". Nature (published 18 February 2016). 530 (7590): 261–262. Bibcode:2016Natur.530..261C. doi:10.1038/530261a. PMID 26887468. ^ Roston, Michael (11 February 2016). "Scientists Chirp Excitedly for LIGO, Gravitational Waves and Einstein". The New York Times. ISSN 0362-4331. Retrieved 13 February 2016. ^ Strom, Marcus (12 February 2016). "Gravitational waves: how they sound and why scientists are going nuts". The Sydney Morning Herald. ^ Drake, Nadia (12 February 2016). "Gravitational Waves Were the Worst-Kept Secret in Science". National Geographic. ^ Twilley, Nicola (11 February 2016). "Gravitational Waves Exist: The Inside Story of How Scientists Finally Found Them". The New Yorker. ^ Allen, Bruce; Buonanno, Alessandra; Danzmann, Karsten (11 February 2016). "The signal caught our eye immediately" (Interview). Interviewed by Felicitas Mokler. Max Planck Society. Retrieved 11 February 2016. ^ Sarah Scoles (11 February 2016). "LIGO's First-Ever Detection of Gravitational Waves Opens a New Window on the Universe". WIRED. ^ Billings, Lee (12 February 2016). "The Future of Gravitational Wave Astronomy". Scientific American. Retrieved 13 February 2016. ^ Knapton, Sarah (11 February 2016). "Moment scientists reveal major gravitational wave finding". The Telegraph. ^ Blanchet, Luc (2014). "Gravitational Radiation from Post-Newtonian Sources and Inspiralling Compact Binaries". Living Reviews in Relativity. 17 (1): 2. arXiv:1310.1528. Bibcode:2014LRR....17....2B. doi:10.12942/lrr-2014-2. PMC 5256563. PMID 28179846. ^ Campanelli, Manuela; Lousto, Carlos; Marronetti, Pedro; Zlochower, Yosef (2006). "Accurate Evolutions of Orbiting Black-Hole Binaries without Excision". Phys. Rev. Lett. 96 (11): 111101. arXiv:gr-qc/0511048. Bibcode:2006PhRvL..96k1101C. doi:10.1103/PhysRevLett.96.111101. PMID 16605808. ^ Blanchet, Luc; Detweiler, Steven; Le Tiec, Alexandre; Whiting, Bernard F. (2010). "Post-Newtonian and numerical calculations of the gravitational self-force for circular orbits in the Schwarzschild geometry". Phys Rev D. 81 (6): 064004. arXiv:0910.0207. Bibcode:2010PhRvD..81f4004B. doi:10.1103/PhysRevD.81.064004. ^ "Why Numerical Relativity?". www.black-holes.org. SXS project. Retrieved 16 February 2016. ^ a b Belczynski, Krzysztof; Holz, Daniel E.; Bulik, Tomasz; O’Shaughnessy, Richard (23 June 2016). "The first gravitational-wave source from the isolated evolution of two stars in the 40–100 solar mass range". Nature. 534 (7608): 512–515. arXiv:1602.04531. Bibcode:2016Natur.534..512B. doi:10.1038/nature18322. ISSN 0028-0836. PMID 27337338. ^ a b "Ancient Stars Unleashed a Space-Time Tsunami Felt on Earth". news.nationalgeographic.com. 22 June 2016. Retrieved 22 June 2016. ^ McNish, Larry (19 March 2012). "The RASC Calgary Centre - The Constellations". Retrieved 16 December 2016. ^ Connaughton, V.; Burns, E.; Goldstein, A.; Briggs, M. S.; Zhang, B.-B. ; et al. (2016). 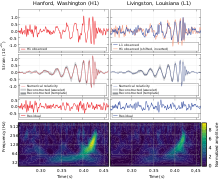 "Fermi GBM Observations of LIGO Gravitational Wave event GW150914". The Astrophysical Journal. 826 (1): L6. arXiv:1602.03920. Bibcode:2016ApJ...826L...6C. doi:10.3847/2041-8205/826/1/L6. ^ Savchenko, V.; Ferrigno, C.; Mereghetti, S.; Natalucci, L.; Bazzano, A.; et al. (April 2016). "INTEGRAL upper limits on gamma-ray emission associated with the gravitational wave event GW150914". The Astrophysical Journal Letters. 820 (2): L36. arXiv:1602.04180. Bibcode:2016ApJ...820L..36S. doi:10.3847/2041-8205/820/2/L36. ^ Tavani, M.; Pittori, C.; Verrecchia, F.; Bulgarelli, A.; Giuliani, A. (5 April 2016). "AGILE Observations of the Gravitational Wave Event GW150914". The Astrophysical Journal. 825 (1): L4. arXiv:1604.00955. Bibcode:2016ApJ...825L...4T. doi:10.3847/2041-8205/825/1/L4. ^ Siegel, Ethan (3 June 2016). "NASA's Big Mistake: LIGO's Merging Black Holes Were Invisible After All". Forbes. Retrieved 9 June 2016. ^ Greiner, J.; Burgess, J.M. ; Savchenko, V.; Yu, H.-F. (1 June 2016). "On the GBM event seen 0.4 sec after GW 150914". The Astrophysical Journal Letters. 827 (2): L38. arXiv:1606.00314. Bibcode:2016ApJ...827L..38G. doi:10.3847/2041-8205/827/2/L38. ^ Connaughton, V.; Burns, E.; Goldstein, A.; Briggs, M. S.; et al. (January 2018). "On the Interpretation of the Fermi-GBM Transient Observed in Coincidence with LIGO Gravitational-wave Event GW150914". The Astrophysical Journal Letters. 853 (1): L9. arXiv:1801.02305. Bibcode:2018ApJ...853L...9C. doi:10.3847/2041-8213/aaa4f2. ^ Siegel, Ethan (2 February 2018). "Black Hole Mergers Might Actually Make Gamma-Ray Bursts, After All". Forbes. Retrieved 14 February 2018. ^ Woo, Marcus (16 February 2016). "LIGO's black holes may have lived and died inside a huge star". New Scientist. Retrieved 17 February 2016. ^ a b Loeb, Abraham (March 2016). "Electromagnetic Counterparts to Black Hole Mergers Detected by LIGO". The Astrophysical Journal Letters. 819 (2): L21. arXiv:1602.04735. Bibcode:2016ApJ...819L..21L. doi:10.3847/2041-8205/819/2/L21. ^ Gough, Evan (18 February 2016). "Did a Gamma Ray Burst Accompany LIGO's Gravity Wave Detection?". Universe Today. Retrieved 19 February 2016. ^ a b Adrián-Martínez, S.; et al. (ANTARES Collaboration, IceCube Collaboration, LIGO Scientific Collaboration, Virgo Collaboration) (12 February 2016). "High-energy Neutrino follow-up search of Gravitational Wave Event GW150914 with ANTARES and IceCube". Physical Review D. 93 (12): 122010. arXiv:1602.05411. Bibcode:2016PhRvD..93l2010A. doi:10.1103/PhysRevD.93.122010. Archived from the original on 15 February 2016. ^ Evans, P.A. ; et al. (6 April 2016). "Swift follow-up of the Gravitational Wave source GW150914". MNRAS. 460 (1): L40–L44. arXiv:1602.03868. Bibcode:2016MNRAS.460L..40E. doi:10.1093/mnrasl/slw065. ^ Barish, Barry. "New results on the Search for Gravitational Waves, CERN Colloquium, 2/11/2016". Retrieved 18 March 2016. ^ LIGO Scientific Collaboration (2016). "Data release for event GW150914" (Data Set). Gravitational Wave Open Science Center. doi:10.7935/K5MW2F23. ^ Overbye, Dennis (3 May 2016). "LIGO Gravitational Wave Researchers to Divide $3 Million". The New York Times. Retrieved 4 May 2016. ^ "2016 Gruber Cosmology Prize". Gruber Foundation. Retrieved 4 May 2016. ^ "Shaw Laureates 2016". The Shaw Prize Foundation. ^ Clavin, Whitney (1 June 2016). "2016 Shaw Prize Awarded to LIGO Founders". Caltech News. ^ "Nine scientific pioneers to receive the 2016 Kavli Prizes". AAAS EurekAlert!. 2 June 2016. Retrieved 2 June 2016. ^ "AAS Announces Recipients of 2017 Prizes and Awards". American Astronomical Society. 9 January 2017. Retrieved 21 January 2017. ^ "The Nobel Prize in Physics 2017". The Nobel Foundation. 3 October 2017. Retrieved 3 October 2017. ^ Mack, Katie (12 June 2017). "Black Holes, Cosmic Collisions and the Rippling of Spacetime". Scientific American. Retrieved 1 July 2017. ^ "Gravitational wave astronomy". Einstein Online. Max Planck Society. 2016. Retrieved 24 February 2016. ^ Camp, Jordan B.; Cornish, Neil J. (2004). "Gravitational wave astronomy". Annual Review of Nuclear and Particle Science (published December 2004). 54: 525–577. Bibcode:2004ARNPS..54..525C. doi:10.1146/annurev.nucl.54.070103.181251. ^ Abbott, B. P.; et al. (LIGO Scientific Collaboration and Virgo Collaboration) (15 June 2016). "GW151226: Observation of Gravitational Waves from a 22-Solar-Mass Binary Black Hole Coalescence". Physical Review Letters. 116 (24): 241103. arXiv:1606.04855. Bibcode:2016PhRvL.116x1103A. doi:10.1103/PhysRevLett.116.241103. PMID 27367379. ^ "LISA Pathfinder exceeds expectations". elisascience.org. 7 June 2016. Archived from the original on 3 August 2016. Retrieved 7 June 2016. ^ Abbott, Benjamin P. (10 February 2016). "The Rate of Binary Black Hole Mergers inferred from Advanced LIGO Observations surrounding GW150914". The Astrophysical Journal Letters. 833 (1): L1. arXiv:1602.03842. Bibcode:2016ApJ...833L...1A. doi:10.3847/2041-8205/833/1/L1. ^ Cooper, Keith (21 February 2016). "Are gravitational waves being 'redshifted' away by the cosmological constant?". PhysicsWorld.com. Institute of Physics. Retrieved 20 February 2016. ^ "Tests of Big Bang: The CMB". NASA. 5 December 2014. Retrieved 24 February 2016. Wikimedia Commons has media related to GW150914.